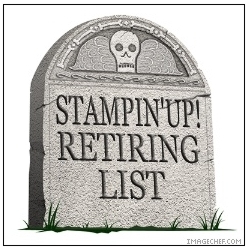 The retired list includes stamp sets that will retire as of January 1, 2008, and there is no limit to the number of retired stamps you can purchase. (If you would like to view the list in a pretty .pdf format, please click HERE). If you do not have the Fall-Winter Collection 2007 catalogue, please click HERE to view it online. The retiring accessories list can now be viewed HERE. To order any of the stamp sets listed above or any other stamp sets and products in the current catalogue, please contact me at caroline@canadiansink.ca.